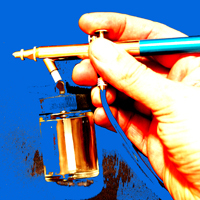 The airbrush is the most versatile and exciting art tool ever created . . . and one set of skills enables you to do it all! Keep this important fact in mind while you read this site!
. . . The airbrush is a very exciting and profound art tool to use. While it is the most powerful and amazing art tool ever created, it is easily the youngest. Unlike pencils, pastels, charcoals, paint brushes, tools that have been around for more than a thousand years, the airbrush is roughly only 120 years old. Despite its very short history, it has burst onto the world art scene causing controversy that still lingers today. It is still an important tool in every field where colour is applied by hand. Regardless of whether you wish to airbrush on steel, wood, cotton, canvas, leather, fibreglass, whatever the surface, the skills stay the same . . . the only thing that changes is the paint that you use for each surface (and you can put any paint you like through an airbrush). Regardless of whether you wish to paint portraits, fantasy art, cartoons, wildlife, landscapes, you name it, you will still just use the same eight strokes (the Octave). Once you learn how to use the airbrush correctly, and which paint goes with which surface, the creative opportunities for you are endless – you can paint any image on any surface, using the same simple system that we will teach you. The biggest impact has been with the Living Art Movement, where people paint objects and surfaces that are lived with rather than canvases that are hung on gallery walls. The Living Art Movement is about people painting children’s bedroom walls, feature walls in homes, restaurants, retail outlets, museums, etc (murallling) . . . about painting peoples cars, bikes, helmets, boats, surfboards, etc (custom painting) . . . about painting t-shirts, jeans, bags, shoes, leather jackets, doona covers, pillow cases, band back drops (textiles), . . . pottery, models, crafts . . . the list of everyday objects and surfaces that people are painting is too long to list here. The Living Art Movement goes far beyond the limited notion of “crafts” when you look at the incredible artworks that are being created by the airbrush community on anything that will stand still long enough. The airbrush is the King of the Living Art Movement, it is the tool of choice. The photos of students, shown here with their artworks, will all tell you that they are normal every day working people, and would not call themselves “talented”, just people who have worked hard to be the best they could be with their airbrushing . . . and have a reached a point where their airbrushing is making a real and exciting contribution to their lives and the lives of their family and friends. One last and very important point. There has been a long standing practice by other airbrush teachers, of touching up students artworks. Airbrush Venturi teachers do NOT alter student’s artworks. All photographs of student’s artworks shown here are 100% their own. The below diagram shows the rapid rise in popularity and commercial use of the airbrush since production began of airbrushes in 1885. Airbrushing was introduced into every single industry that ever applied colour by hand. The list of industries that have used an airbrush over the last century or so, could fill a book (see the Student Resources section). The only “blip” in its amazing story was the introduction of the computer and its effect on many of the industries that used the airbrush (and other skills), in the 1970’s and ‘80’s. While this led to many changes, airbrushing has largely held its ground, and since the 1990’s has seen a significant resurgence, as industry look for skills that give them a skill based edge.